The Evoqua Modified Ristroph Fish Screen reflects the best technology available to safely and gently remove fish from intake screens. The Evoqua Modified Ristroph Fish Screen reflects the best technology available to safely and gently remove fish from intake screens. 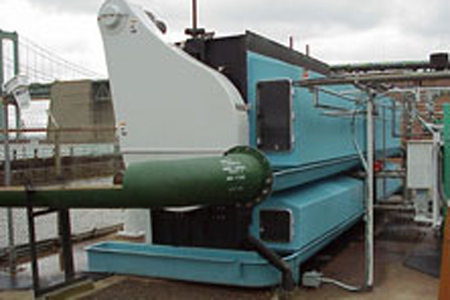 Design features include special screening panels with deep buckets, smooth surface meshes, flow spoilers, low pressure spray systems, and special discharge fish troughs. The Evoqua Modified Ristroph fish handling screens are proven to safely remove fish from intake systems. Developed specifically for environmentally sensitive conditions, the Modified Ristroph screens have been approved as best available technology (BAT) in several states. The Smooth-tex® flat wire screen surfaces minimize fish injury, and a unique turbulence-free zone excludes even very small fish. The Modified Ristroph screen is designed to be easily retrofit to even the oldest water intake system. Continued research programs, working to refine and modify fish-handling screens so they are safer for all aquatic life. Retrofitting is an economical alternative to replacing entire intake screening system. Engineering support services will accurately predict system demands and sizing requirements for each installation. OEM replacement parts available for Rex® and Link-belt®. Link-Belt® is a trademark of FMC Corporation. REX® is a trademark of Rexnord Corporation.